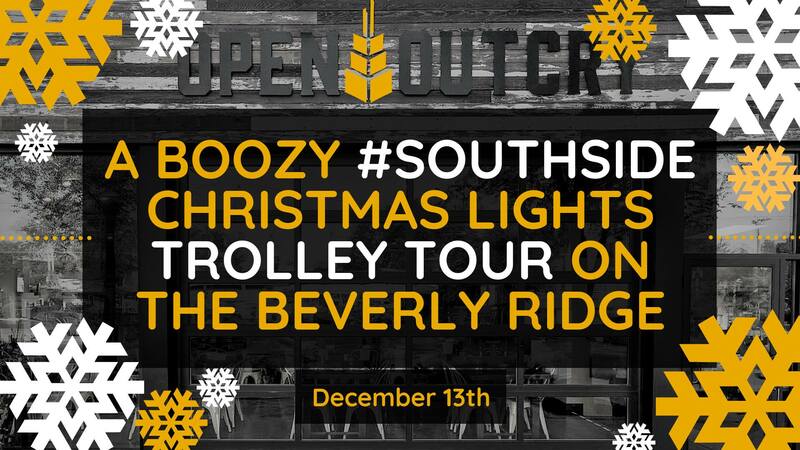 • A trolley tour of The Beverly Ridge’s finest decorated homes. • A Crowler of Speculator Cream Ale, or a Tom & Jerry Cocktail for the trolley ride. • Upon returning to the brewery, you will be greeted with live Christmas Carol singing. • An appearance by Santa Claus himself. • An Open Outcry Brewing Company 2018 Christmas ornament. The first tour departs the brewery’s rear parking lot at 6:00 pm, returning at 7:15 pm. The second tour leaves at 7:30 p.m. and arrives back at the brewery at approximately 8:45 p.m.
Limited capacity. For reservations, visit the Eventbrite page below.